Margaret inherited a diamond set ring from her mother-in-law and wanted to use the diamonds to create a piece of jewellery that she could enjoy wearing every day. This modern handmade Sterling silver dress ring gives the family diamonds a new lease of life by grain setting them into a square plate. 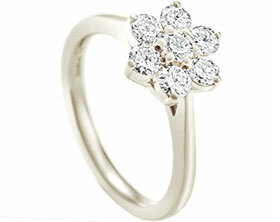 A polished finish brings out the sparkle of the beautiful sentimental stones.